I love autumn in New England - crisp, clear days; slanting light; changing foliage; wood smoke on the breeze. However, for those of us who also love certain convertible, front-engine/rear-wheel-drive modes of transportation, there are sad days in the fall - like the first real frost telling us that soon we'll have to live through another five-plus months of keeping our heads inside the windows, so to speak. 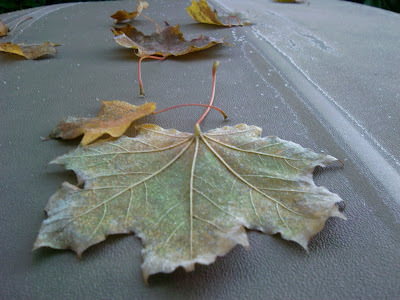 Last week one morning I found the calling cards of cold-weather-driving on my soft-top: frost and fallen leaves. I think the end is near.